Flaxseed oil and vitamin E are both natural substances that provide some similar health benefits. Although vitamin E is an essential nutrient that your body requires for many important functions, flax and flaxseed oil aren’t considered essential substances. Both offer a range of health benefits, and might even lower your risk of some diseases. However, before you begin taking vitamin E or flax oil, discuss possible health risks, side effects and drug interactions with your doctor. Vitamin E mainly acts as an antioxidant in your body, combating harmful substances called free radicals. Vitamin E’s antioxidant effects protect your body’s cells from death or DNA damage, and also helps your body to utilize vitamin K and form red blood cells. Flaxseed oil serves as a source of omega-3 fatty cids, particularly alpha-linonlenic acid, or ALA. Your body converts this ALA into docosahexaenoic acid, or DHA, and eicosapentaenoic acid, or EPA -- two fats that benefit cardiovascular health and play a role in healthy brain function. Omega-3 fatty acids help your body to control inflammation, along with promoting overall health. Both vitamin E and flaxseed oil may help reduce your risks for heart disease and cancer. Additionally, flaxseed oil could potentially help in treating high blood pressure, high cholesterol, bipolar disorder, rheumatoid arthritis and Sjogren’s syndrome. Vitamin E supplementation might help protect against photodermatitis and sunburns, prevent or slow the development of Alzheimer’s disease, ease menstrual pain and support eye health, according to the University of Maryland Medical Center. Taking vitamin E supplements can help in treating anemia and epilepsy in children and improve immune function in elderly individuals, notes the University of Michigan Health System. Vitamin E is a fat-soluble vitamin, meaning that you must consume fats to absorb it properly. Theoretically, taking vitamin E with flaxseed oil could increase your absorption of the vitamin. Also, flaxseed oil is often manufactured with vitamin E because the vitamin helps keep the oil from spoiling when exposed to heat, light and oxygen. 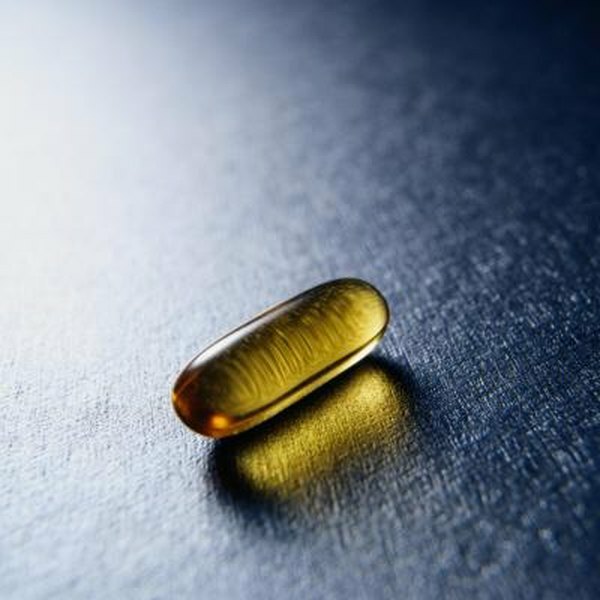 Both vitamin E and flaxseed oil supplements can pose some health risks for certain people. Do not take it at the same time as other supplements or drugs without an OK from your doctor. Flax oil could also increase your fasting blood-sugar levels, which may lead to an increased demand for blood sugar lowering medications for treating diabetes. Vitamin E could increase the severity of respiratory infections in elderly people and the risk for heart failure in people with diabetes or heart disease, says the University of Michigan Health System. Risks associated with vitamin E supplementation are most common when you take very high doses over long periods.